Shimmering longline necklace seeks simple outfit to brighten up. Has a delicate dual-layer design made from metallic mini circles. Enjoys long walks on the beach, cocktails on rooftops and sparkling conversation. 84cm/33" total long chain length, 77cm/30¼" total short chain length with 6cm/2½ extender chain"
84cm/33" total long chain length, 77cm/30¼" total short chain length with 6cm/2½"
This shimmering necklace loves being layered but with intricate metallic discs it's also elegant enough to stand out on its own. Pair with your best LBD to let it shine. 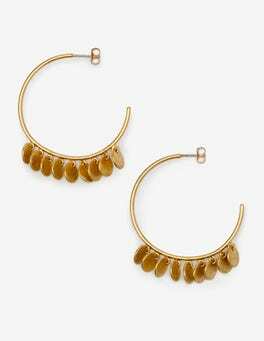 Unleash your inner Greek goddess with these delicate earrings. They feature small shimmering discs hanging from the metallic hoop – perfect for adding shine to any outfit. Wear them alone or pair with a matching necklace to effortlessly pull together a look that would make Aphrodite proud.